Bishop Mark S. Rivituso spoke with 94-year-old Bridget Griffard, known as the “Energizer Bunny” of the Immaculate Conception in St. Mary, as she exited the church after Mass April 15. Griffard received all her first sacraments at the parish and has until recently cooked the parish’s chicken and dumpling meals and belonged to the quilt club. In his Jubilarian profile in 2015, Father Richard C. Kasznel described the blessing of spending nearly three decades as pastor at Immaculate Conception Parish in St. Mary — population 360, about 75 miles south of St. Louis and just west of the old Mississippi River channel and Illinois’ Kaskaskia Island. Father Kasznel’s assessment pretty much sums up the history of the parish, which was founded in 1874. 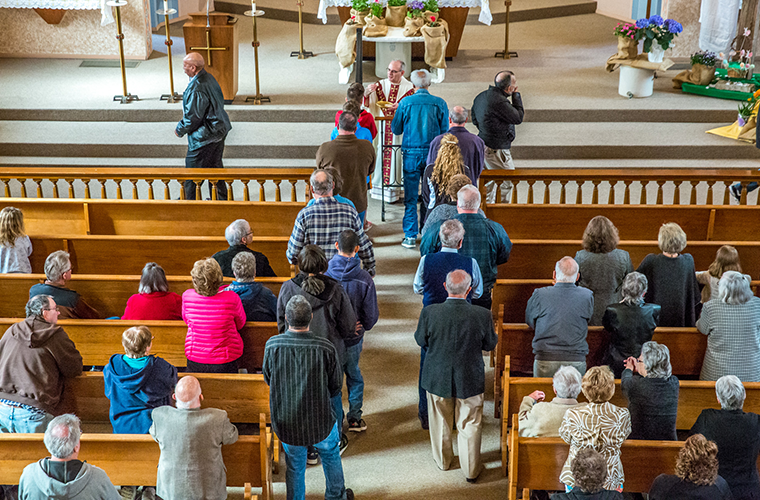 Over 144 years, generation upon generation worshipped at Immaculate Conception and celebrated countless sacramental events — Masses, baptisms, confessions, First Communions, confirmations, weddings and funerals — at the small parish of 295 members in 105 households. 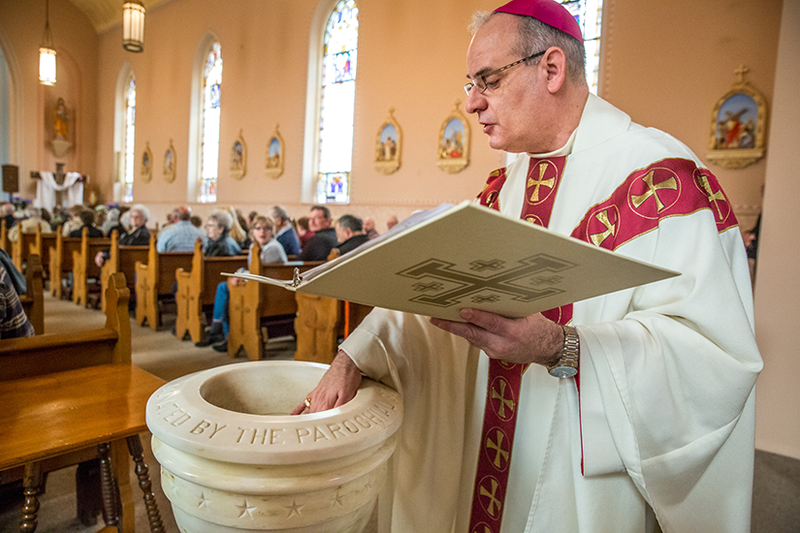 Bishop Mark Rivituso placed his hand in the holy water font at Immaculate Conception Church in St. Mary's. Immaculate Conception Parish celebrated its final Sunday Mass April 15. Bishop Rivituso walked around to different parts of the church, saying a brief prayer of thanksgiving for the blessing received in the church. Auxiliary Bishop Mark S. Rivituso honored these sacramental moments, as well as parishioners past and present, at the parish’s final Sunday Mass April 15. With Father Kasznel’s retirement after 53 years as a priest and 31 years as pastor, Immaculate Conception Parish has closed. Holy Water • At the fonts, donated by “Parochial School Children” and “Married Ladies,” congregants were reminded of baptism — the waters of baptism — upon entering and exiting the sacred space, dipping their fingers in holy water preceding the Sign of the Cross. Confessional • Father Kasznel and parish priests before him heard the faithful’s confessions and, most importantly, offered absolution to wipe away the stain of sin. Blessed Mother • A statue of the Virgin Mary and the icon of Our Lady of Perpetual Help honored Mary, whose birth without sin — the Immaculate Conception — was recognized in the naming of the parish. Ambo • Through Scripture readings and homilies, the Word of God was proclaimed to the faithful. Tabernacle • Jesus Himself inhabited this space, the True Presence in the form of consecrated hosts placed within a ciborium between Masses. Altar • The centerpiece of worship, at which every sacrifice of the Mass celebrated the Resurrection. The hymn, “Alleluia! Alleluia! Let the Holy Anthem Rise,” filled the church one last time as Bishop Rivituso processed out, followed by 110 souls at the final Mass. He stopped just outside the church doors to meet each of them upon exit. With smiles, handshakes and hugs, they briefly shared their special stories and universally gave him the thumbs-up for recognizing the significant places within the church and giving them a sense of closure. Parishioners at Immaculate Conception in St. Mary received the Eucharist in the church’s final Sunday Mass with Bishop Mark Rivituso on April 15. Similarly, Joan Marie Welker, nee Maloney, spent significant life moments at the parish, including her engagement. Husband Francis presented her engagement ring in front of the Blessed Mother statue, and they were married in the church in 1961. Her parents and brother also were buried from there. Three neighboring parishes are available to serve the parishioners of Immaculate Conception in St. Mary: Sacred Heart Parish in Ozora (7.7 miles from St. Mary), Christ the Savior Parish in Brewer (7.9 miles), and Ste. Genevieve in Ste. Genevieve (9.3 miles). • Mr. and Mrs. Louis Schaaf Sr. Note: The stained-glass windows and other liturgical furnishings were donated to the parish for use in liturgical and/or sacred spaces, so that original purpose will be honored. If the items don’t find a liturgical home in the immediate future, they will be transferred to the archdiocesan Reclamation Center, which safeguards and houses these types of items and provides them to churches, religious communities, missionaries and seminarians.